Plantronics Blackwire C225 Stereo Single 3.5 mm PC/Mac Headset is structured to be used at work and can easily be connected to specific devices, including tablets, smartphones, Mac, and PCs. This device is part of an ensemble of a powerful communication solution that can support telecom needs and foundations of organisations and companies worldwide. Some of the technologies and systems integrated with the headset can help users to have better conversations, which can result to better productivity at work. Some of these technologies are the built-in noise cancellation in microphones and the SoundGuard technology for enhanced hearing protection. 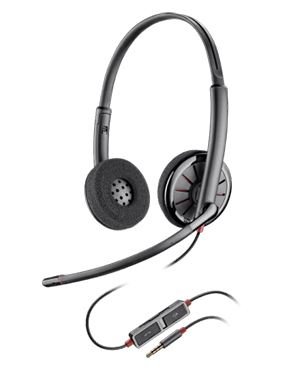 Plantronics Blackwire C225 comes with a 3.5 mm audio jack, which provides compatibility in the devices that has this connectivity. Some of its functionalities include mute feature and volume control. Do you want to have your own headset of this model? Give Headsetsonline a call at Australia wide 1300 131 133 hotline! Plantronics operates in the global market with its headquarters currently located in Santa Cruz, California and its manufacturing and production floors in Mexico and China. The company is able to provide the needs of customers from approximately 80 countries worldwide in North America, Asia Pacific Region, and Europe. The company makes it possible to do so through the help of distributors, partners, service providers, and retailers all over the world. Plantronics was founded in the year 1961 and since then has been an instrument of one of the largest events in the history of mankind- the very first time that a man has ever set foot on the moon. It has made its mark in history in the year 1962 and 1969. The former year is when the company developed and introduced the very first lightweight headset in the industry while the latter one involves the first man to ever step on the moon who used a Plantronics headset to communicate to earth. Headsetsonline Pty Ltd is an Australian enterprise known for putting customers at the centre of their operations. It makes sure that customers can conveniently access all of the products and solutions offered by the company through its secured and enterprise-encrypted online store at Headsetsonline.com.au. The site uses the same security settings as banks through its 256-bit identity authentication and 2048-bit root encryption. It also has green URL address bar HTTPS and GeoTrust True Business ID with Extended Validation for additional safety for all transactions. Customers can complete all their purchases through the site with ease. Headsetsonline has been operating in the market for decades and has always been particular with the quality of its offers. The company chooses Australian distributors, which means that the products that the company offers are Australian standards certified and that all warranties that come along with it are guaranteed to be applicable all over Australia.